2Checkout.com Inc. (Ohio, USA) is a payment facilitator for goods and services provided by Crosswind Music. 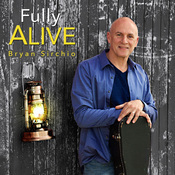 "Fully Alive!" is my most recent solo release and I'm really thrilled with how it turned out. This is my first solo "singer/songwriter" album since "Justice and Love," and it contains a bunch of tunes that many folks have been waiting for me to record for a long time. The record is diverse and takes the listener on a journey to many different musical landscapes and lyrical moods. There are plenty of gentle encouraging songs such as "In God's Hands" (the song I wrote for my mother when she was terminally ill) and "I Am Welcome" in this collection. But there are also some challenging and prophetic songs on the record which I think are likely to generate some interesting conversations and responses. Here's a list of the tracks in the order they appear on the album. The songs are also available individually on i-tunes and as individual track downloads on my bandcamp site.